It's that time of the year folks, that time of the year! Every year, I cave and get a jar of Nutella from the grocery store. I only indulge rarely, mostly due to the fact that the jars rarely make it more than a couple days in my pantry. Because, really, is there anything better than a little spoonful of Nutella (or two, or three?)? Well, these little treats might be the next best thing. I had as a mission to put this jar of gooey chocolate hazelnut goodness to good use before it was gone in smoke. So here you are, Nutella bites! These are incredibly, incredibly easy to make - they literally take minutes- and only require 4 ingredients. The marshmallow is optional of course but it makes for a fun touch - perfect for kids and an added touch of gooeyness in the center of each Nutella brownie bite. I also wanted to announce the winner of the ThinkFood cookbook contest! The free copy of this brain-healthy cookbook goes to Megan at Foodalution. Congratulations! Heat the oven to 350 degrees. Line a 12-cup mini muffin pan with paper liners. Put the Nutella and egg in a medium bowl and whisk until smooth and well blended. Add the flour and whisk until blended. Spoon the batter into the prepared muffin tins (about 3/4 full). Place a marshmallow in the center of each brownie and gently press down with your finger so you can only see the tip of each marshmallow. Bake until a toothpick inserted in the brownie part of each bite comes out with wet, gooey crumbs, 11 to 12 minutes. Set on a rack to cool completely. Serve immediately or cover and store at room temperature for up to 3 days. These look so good!!! I`m looking for some new and updated treats for Christmas and these will fit the bill. Saving for the holidays - thankyou for posting a wonderful recipe. I love nutella, these are so simple yet look SO good!! Mmm look yummy. I love how few ingredients they use - I think I have everything in the cupboards now! Hi! Nice to meet you! I'm Mirtilla from http://pasticciepastrocchi.blogspot.com/ ! I've just discovered your beautiful blog and I like soooo much this recipie! I love nutella.. I can't stop eating it! ANd this cakes look delicious! super yum! i totally should try this! I love this recipe. Nutella is my new found love, so this recipe is moving to the top of the to-make list. Are you kidding me? Is this for REAL? This had better not be some cosmic joke. ;) I have all 4 ingredients at home right now and I MUST MAKE THESE!!! omgosh these look like the perfect afternoon pick-me-up snack and SO simple I can't believe it! Am going to try them with Gluten Free Flour and see how they go! Thanks! Jas. : Let me know how they turn out! Love your photos! I am making these stat! Those look good! Nice way to enjoy some nutella! 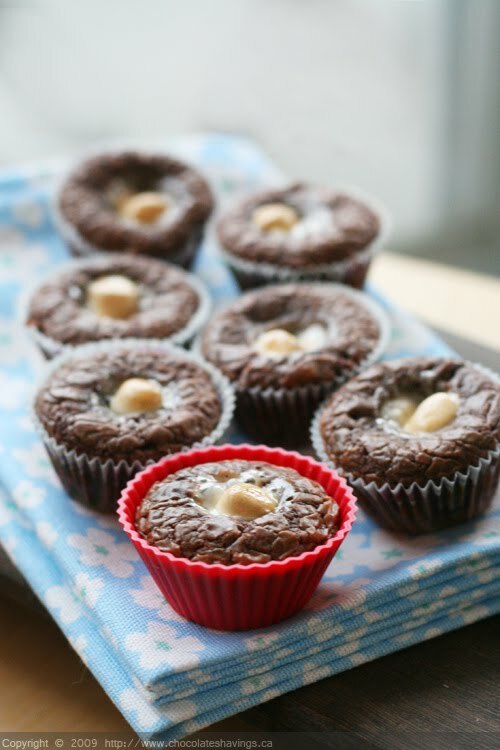 Nutella brownie bites looks great, specially one in red cup! I have not cooked much with Nutella before, so this gives me an incentive to do it. These are incredible! I went to visit my brother today and made them for him and his lady- i cut little holes in the center to fill with more nutella and then topped them with the marshmallows and popped them in the oven for another couple minutes for super melty nutella and perfectly toasted marshmallows. i'm making another batch as we speak! thank you so much. kujoton: I'm glad you enjoyed them! They're so incredibly easy to make, aern't they? I am now in my kitchen and I am planning to make some. I still need some ingredients to buy. I am so excited for this. That was probably the most easiest and most delightful thing I've ever done in my life. Thank you for the awesome recipe! Anonymous: I'm glad you liked them!